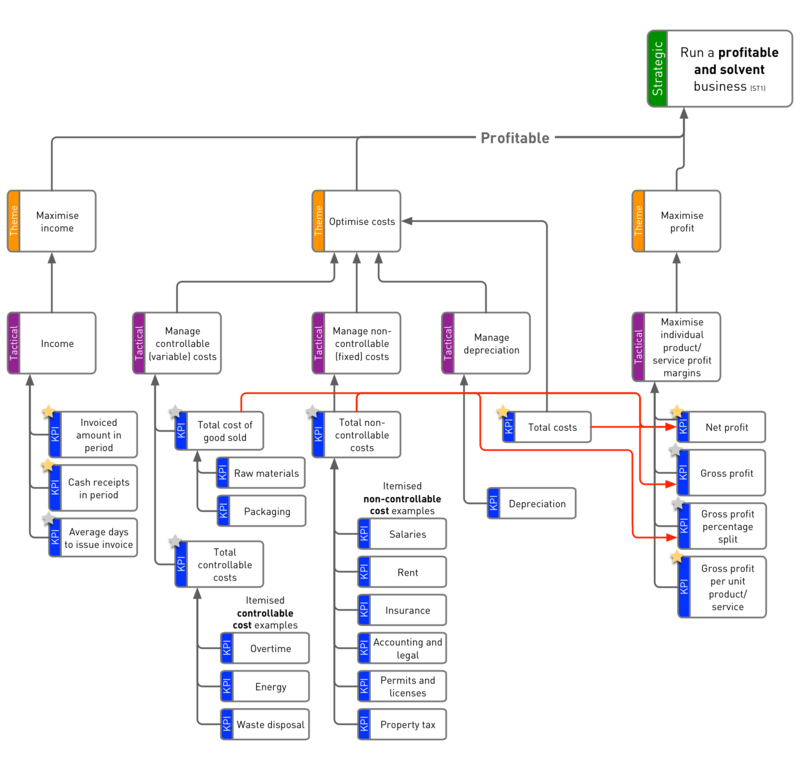 Creating Meaningful KPIs: Why use a KPI Tree? Most strategic objectives are high-level outcomes. It’s very hard to agree with total confidence that you should, for example, measure ‘process moisture content’ as a way of delivering ‘lowest cost per metre production of all manufacturers’ unless you understand precisely how one links to the other. 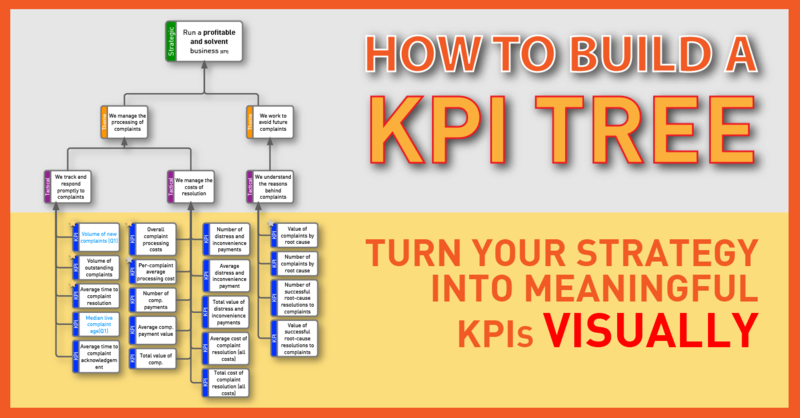 KPI Tress are all about turning strategic objectives into meaningful KPIs. What does a KPI Tree look like? There are a number of benefits that come from using KPI Trees. With the KPI Tree you naturally arrange sub-measures into meaningful groups. Creating high-level summary measures becomes relatively straightforward, as all you need to do is decide on the relative weightings and the arithmetic you use to blend the sub-measures. Every client I have worked with has featured a dominant character in the group. They can bounce a group into a particular set of measures through a mixture of rational argument and strength of will. Creating a KPI Tree avoids this through a highly collaborative series of sessions. It also gives a tool, structure and visible output that anyone can easily challenge and question. It normally takes two two-hour workshops to get a group up to speed and to successfully create a complex KPI Tree, but it’s possible to get a group to grasp how to read one with about five minutes of explanation. It can also become a powerful way for the executive to explain their strategy in terms that a group can really understand. It shows a depth, coherence and clarity of thought that’s rare when it comes to strategy and measures. Businesses, markets and executive teams change. It’s absolutely guaranteed that, if you are lucky enough to have a good strategy, it will have to change - possibly very soon. Using the KPI Tree approach means that you can see what impact changes in the strategy will have on measures. You can have too much of a good thing. It’s especially true in the world of measures. By pushing a ‘good’ measure too far you can unexpectedly have a negative impact on your ultimate strategic objective. All of these benefits help you choose meaningful and effective KPIs. If you don't use an approach like this then your KPIs are normally selected by the person with the loudest voice or strongest personality. 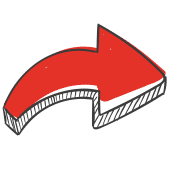 Below is a single branch from the earlier example, showing how you move progressively closer to something you can directly measure as you move towards the ‘measures’ level of the diagram. Any ‘node’ on the tree can be linked to any other to show a relationship. Use colour, intensity or terminator shape to distinguish between the three link types, described below. Where one activity directly influences another. This the most common type of relationship, so I use a plain grey line for this. Where one activity conflicts with another. I use a red line to show this. Minimise 'Average Handling Time’ conflicts with ‘Maximise First Touch Resolution’. ‘Minimise performance rewards’ conflicts with ‘We have motivated staff‘. Where one measure is a subset of the other, or there is significant overlap. I use a double line for this - implying a two-way relationship. ‘Reduce loss from car accidents’ is a companion objective to ‘Reduce injury from car accidents’. Here's an example of it all being put together. 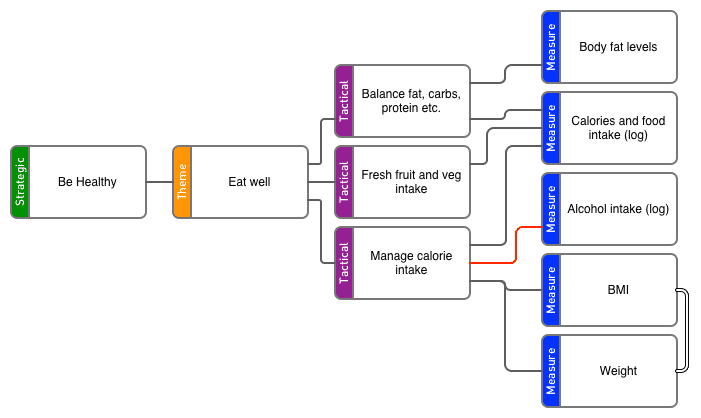 It's the 'profit branch' from a Financial KPI Tree I built for my latest book. Signup using the form below if you would like the full tree sending to you by email as a PDF. The downloadable version includes 'solvency' branch too. Get the full Financial KPI Tree example as a free download! Download the full sample for free! Become fully familiar with the strategy of your organisation. Become fully familiar with the strategic objectives of your organisation. Double-check those strategic objectives with all engaged senior stakeholders - if there are differences then they must be ironed out before the sessions. Check that there are between two and seven strategic objectives - if there are more than this, it is likely that lower-level tactical objectives are in the mix. Gain support and approval to hold a session from senior stakeholder(s). Pull together some example outputs from previous sessions (or use the examples included in this book). Gather your stakeholders together in groups. Select groups of between three and nine people per session (certainly no more than twelve). Select group to have a good mix of seniority. Organise two two-hour long workshop sessions, separated by between one and five working days. Book meeting rooms for both sessions. Create briefing email and send out invitations. Base group selection around broadly similar remits. Make sure there are desks available for them to work at. Ensure a whiteboard is available, if possible. Print out examples and worksheets. Take Post-Its and pens to the session. A camera phone can also be useful. Identify the strategic objectives - agree these with the group. Give the background to the session. Get the group to do a simple (non-work) exercise example. Explain the three link types: cause-effect, conflict and companion. Help the group work through a more complex non-work example, including link types. Get the group to develop a draft KPI Tree specific to the group's relevant organisational strategic objectives. Develop one tree per objective. The trees will almost certainly cross-link so it makes sense to create them using one large sheet if possible. Tip: If the participants start to get anxious about the number of potential measures this process is throwing up, then it's worth reassuring them that the whole point of this step is to generate the longlist of measures. You will absolutely not simply take this longlist and attempt to implement it as it stands at the end of this session. There is a critical next step which involves shortlisting candidate measures. Write up the trees from all groups and merge into one tree. Add notes to show where decisions have had to be made on the merge. Are there important factors that will not register with any of the measures identified? If so, then you have missed something out of your tree. Is there a way of making a measure go the `right' way, but by doing something stupid? Add any further branches that need adding. Make corrections and discuss the merged tree. The second session is normally quite straightforward as the group will be fresh, familiar with the purpose of the session and used to working as a group. Finish drawing up the trees from the second session (there may be several trees, but there should be only one version for each objective, the various versions having been merged after the first session). Add explanatory notes as needed. Circulate to the participants for final approval. State that the absence of a response will be taken as implicit approval. Does the read/edit software have to be a standard desktop application (like Microsoft Word or PowerPoint) or do you have the chance to install specialist applications like Visio or Aris? What is the IT skill level of the users? Do you have to attach meta-data to objects? If so, you will need to go for a more specialist diagram package e.g. Visio. Is there a company standard currently in use for this type of diagram? E.g. 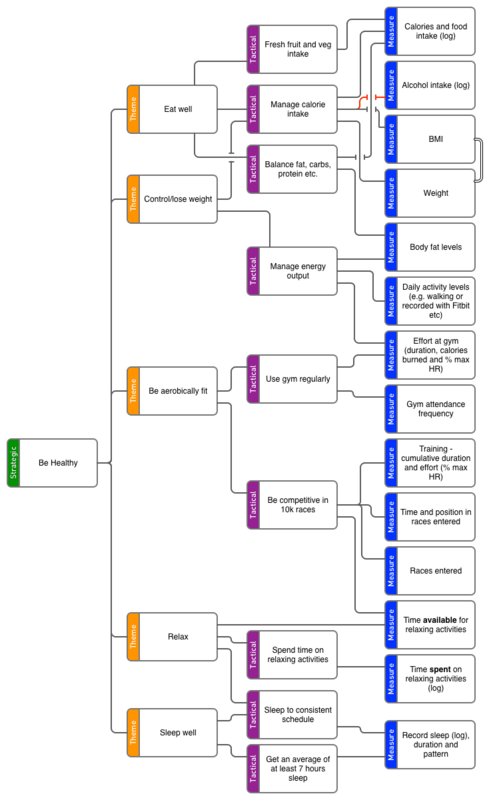 Mindjet, mind mapping software. Will the software be used on a variety of operating systems? Some applications like OpenOffice, Freemind and Mindjet cover two or more operating systems. Others, such as Visio, tie you firmly to one platform. What level of annotation and general sophistication are you looking for? How many nodes/branches do you need to fit in?